Acrylic gouache is the name given to fluid, matt acrylic paint. It is not re-wettable. It dries with a matt finish. It does not retain brush marks. It is fast drying. Specialist colours available, including metallic, luminescent and iridescent shades. 109 colours available in 20ml tubes and 4 colours available in 40ml. 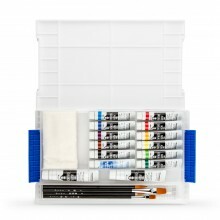 A variety of sets available for beginner or experienced artists.